100 1 %a Dvořák, Antonín Leopold %d (1841-1904). 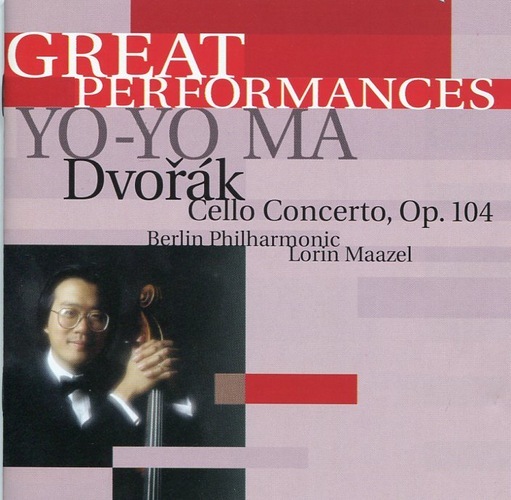 245 1 0 %a Yo-Yo Ma %h [Dokument dźwiękowy - płyta] : %b Cello Concerto, Op. 104 / %c muz. Antonin Dworak ; cello Yo-Yo Ma ; dyr. Lorin Maazel ; Berlin Philharmonic. 260 %a Austria : %b Sony Music Entertainment, %c 1999. 300 %a 1 płyta CD (57 min 25 s) : %b digital ; %c 12 cm. 505 0 # %a Zawiera: Concerto for Cello and Orchestra in B Minor, Op. 104 ; Silent Woods in D-flat Major, Op. 68, No. 5 ; Rondo for Cello and Orchestra, Op. 94. 650 9 %a Muzyka czeska %y 20 w.
710 2 # %a Berliner Philharmoniker.